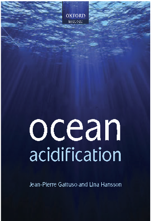 Ocean acidification is a high priority research topic identified by OCB. 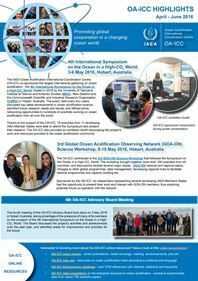 The far-reaching effects of ocean acidification on marine biogeochemical cycles and biology, combined with the increasing interest in the topic both nationally and internationally, prompted the OCB-SSC to recommend the formation of an Ocean Acidification Subcommittee. The Subcommittee is being co-chaired by Joan Kleypas (NCAR) and Richard Feely (NOAA/PMEL). With approval from the OCB-SSC, the Ocean Acidification subcommittee members were invited from the U.S. community of researchers. The collective expertise of the Subcommittee encompasses the broad spectrum of topics relevant to ocean acidification. Recently, Subcommittee members prepared a white paper that outlines a U.S. national ocean acidification research strategy. This OCB white paper will be distributed broadly to those affiliated with ongoing national and international ocean acidification programs and activities, and will be integral to the development of a national ocean acidification research agenda. OCB NEWS, Winter 2009, 2(1):11. Newsletter.